Please be advised that the following brands of nori have been recalled as of September 5, 2018. The lot numbers are usually ink-jetted on the bag or package. 4) Huaxin Seaweed – All bear an unauthorized Kof-K symbol. Should be considered not kosher. 5) Ushia Sushi – All bear an unauthorized Star-K symbol. Should be considered not kosher. Any brand/lot that is NOT part of this recall is permitted at the current time. NOTE: All nori must bear a kosher symbol. 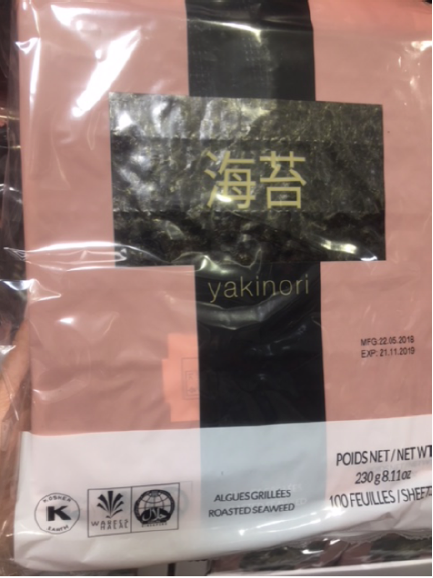 Nori without a kosher symbol has a concern of being processed on non-Kosher equipment and may not be used (even with checking for insects).